A few days ago I went up the big bambu. I know what your thinking what is that (or chocolate) it is some bamboos taped together to make cool rooms. They said it only took 7 weeks to build. It is so awesome I was a bit scared that it will brake but apart from that it was really fun. Oh yeah I went with three family members,Ofri, Amit, and Pori, when we were really high I saw most of the other structures there were some cool ones and some okay ones. Once we got off the first time we went back up a second time. That time I was less scared but still a little scared. (I want chocolate now!!!). Today was my last day of camp and also the worst day of my life. First we met and played cards, and then we went to the pool. It was okay till everyone tried to take our counselor down. I got hit in the chin and the back of my leg. Once we were done with the pool, we went to the field to play a game where we had to do quests to make a magic liquid. I quit playing after two quests while everyone else was still playing. Then we went to the forest and red ants climbed and bit me. Once camp was over nothing else bad happened to me. The rest of the camp was good and tomorrow I wake up very early and go to the airport and fly to London. A few days ago I went to my cousins house. His name is Yuval and he has two sisters one is named Ofri and the other sister named Sheckid. We played fun games like taki and hide and seek in the dark. I know a really good hiding spot you sit down against the wall and lift your feet. We also played soccer (my brother lost the ball) then we slept there. The next day we played the same games (except for soccer) and at night we went home and went to bed. today I met my cousin Onn we went to have pizza with him. I ate three slices my brother ate three slices and everyone else ate one slice. we ate at a place called mystic. we ordered two large pizzas and one coke zero. yesterday I left my grandpa to go to visit my grandma but we made a quick stop at my aunts house in the country. We met our little cousins then played soccer in the backyard then we went to my grandma my dad then went back to my aunt to sleepover there. now today I am leaving my grandma. 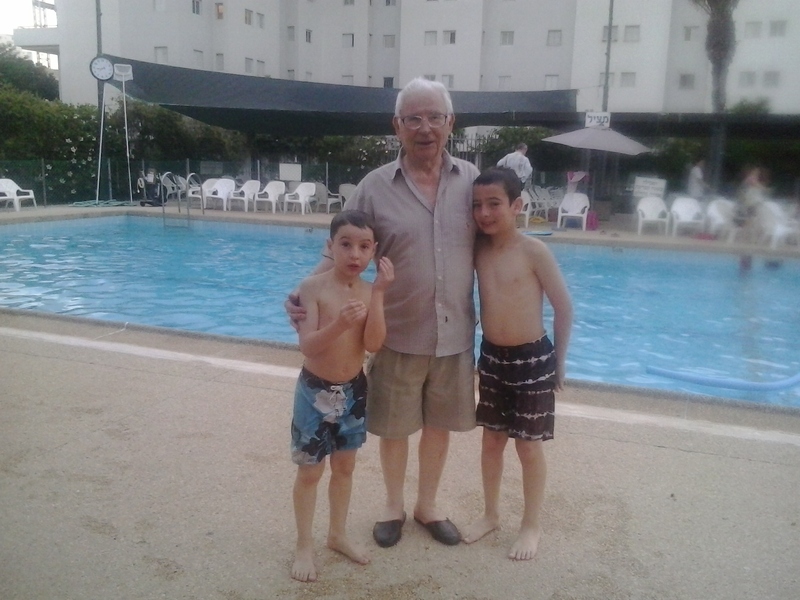 today me, my brother, my dad and my grandpa went to the pool. The camp is at the Tel-Aviv university. I woke up at 6:30 AM, brushed my teeth, got dressed, ate breakfast, and walked with my dad and my brother to the bus stop. After a long wait, the bus finally arrived and we got on. When we arrived, I met my group and my fencing instructor, and after few minutes we all went to the fencing studio. We practiced some simple stuff, and then got our real fencing equipment and swords. In fencing, you have to hit your opponent three times. When it was my turn, my opponent got 1 hit and I got 1 hit, then I got 1 hit and he got another hit, and then he got the finale hit. After fencing, we played a few games, ate bread, and then went to the pool to take a swimming test. I did okay. We went back to our part of the camp, ate lunch, and came up with a name for our group – we call ourselves “the no namers”. After camp, we got back on the bus, went to Saba’s home, had pizza dinner, and went to sleep.